Four-color process printed on Side 1 of 12pt C1S White Semi-Gloss stock. Coated with Aqueous Soft-Touch. H1 business card slits on both pockets. 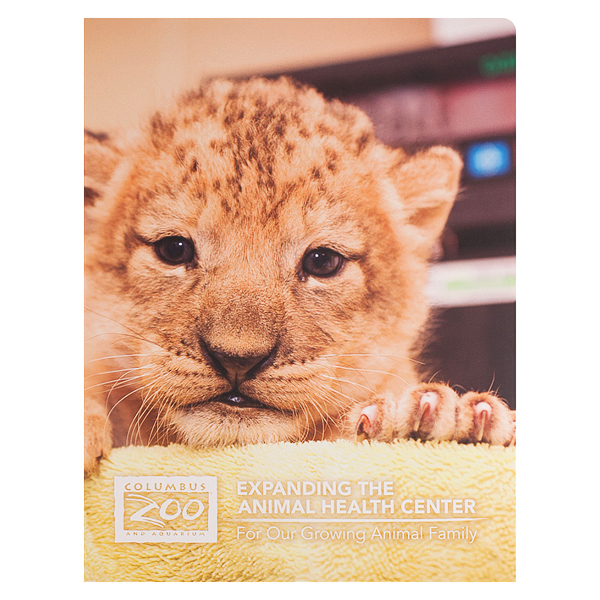 Adorable baby animals advertise the Columbus Zoo & Aquarium's expanded animal health center: a lion cub on the cover, with a baby polar bear and a hatchling on the pockets. Thanks to their steep angle, the pockets frame the images so the animals are the natural focal area. On the back, the lion cub's paw points to the contact info. Side 1 printed with 2 PMS colors using light coverage. 12pt C1S White Semi-Gloss stock coated with Aqueous Soft-Touch. V4 business card slits on right pocket. Philadelphia hotel The Windsor Suites welcomes visitors with this visually compelling design. Light gold lines create a geometric pattern as a background for both covers and pockets. The URL on the front cover lets recipients book their next visit. On the back, they can find a list of other hotels owned by the same parent company, Modus Hotels. A wise concept from Benjamin Franklin tops off the design and subtly tells guests how to best enjoy their stay. Four-color process printed on Side 1 of 12pt C1S Semi-Gloss stock. Coated with Aqueous Gloss. H4 business card slits on right pocket. 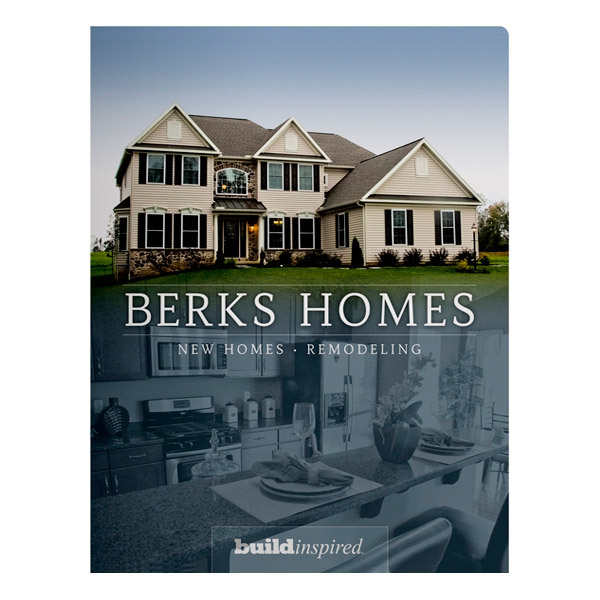 On the top half of Berks Homes' cover, a full-color image beckons potential buyers to visualize living in the new home with its warm lights, manicured yard, and grand exterior. Below, a colorized photo of a kitchen matches the Berks brand colors. Its monochromatic hues make the lower image seem faint, as if the prospective buyer is outside the home imagining the kitchen within it. Upholding the same cutting-edge style as the home displayed on the front cover, diagonal cut pockets create a dramatic interior. Another colorized image shows a house darkened almost to the point of silhouette, hinting at the possibilities hidden within its walls. Side 1 printed with 1 PMS color and 1 sculpted embossed area. 80lb Warm White Felt stock uncoated. H1 business card slits on left pocket. The DuPont Country Club advertises its two locations with one stunning piece. 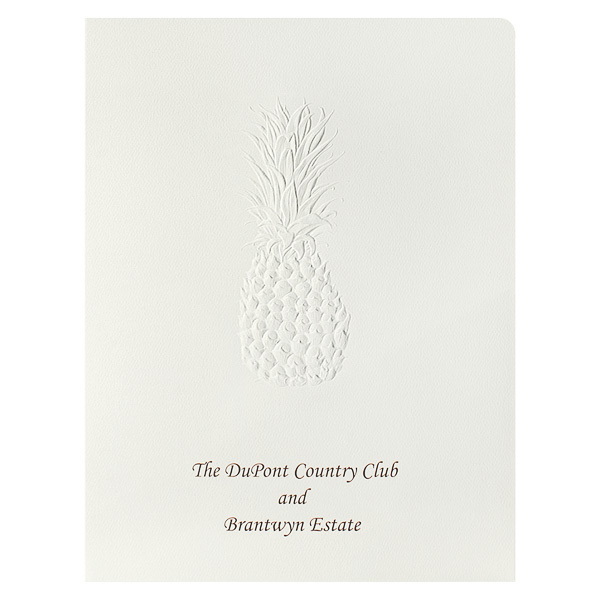 A sculpted embossed pineapple adds multiple tiers of texture to form a 3D element that pops out of the panel. Its intricate detail suggests that a wedding at each venue will be equally gorgeous. The decorative type bears the elegance of a script font, yet the readability of a classic serif. Logos for both locations appear on the back cover, above contact information for the DuPont. 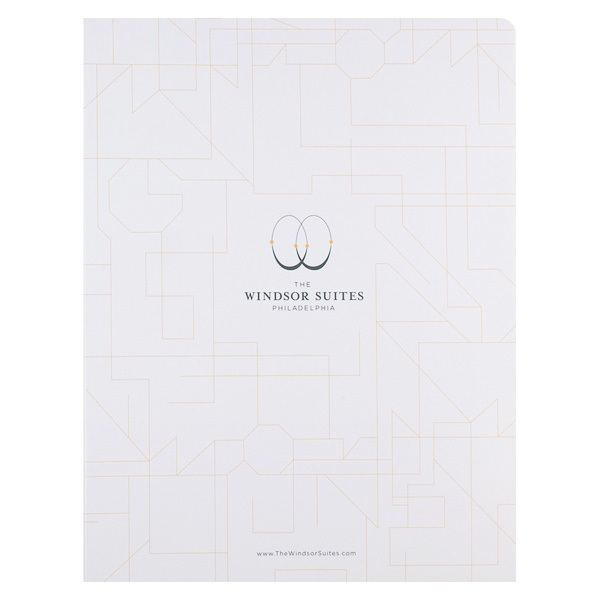 This slash pocket design has the traditional size and shape of a regular round-corner presentation folder, but recipients are in for a surprise when they open the cover. Cut on a dramatic diagonal, these two interior pockets create a sharp, sleek look that presents 8 1/2" x 11" documents in style. The slash cut stands taller than a regular pocket on one side, with its highest point on the outer edge of the panel to ensure that documents stay locked in place. The sloping line of the diagonal, reaching its lowest height in the center of the design, draws recipients' eyes straight to the contents of the pockets—right where you want them to look. Dimension Closed: 9" x 11 3/4"
Dimension Open: 18" x 11 3/4"